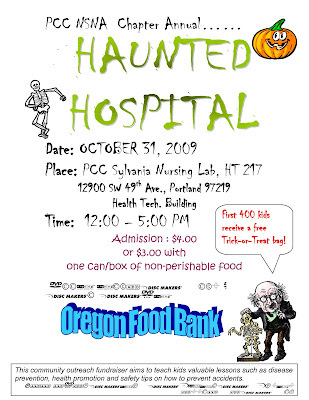 On Saturday, October 31st, the Portland Community College Chapter of the National Student Nurses Association will be transforming the Nursing skills lab into a frightful Haunted Hospital on Halloween! The cost is $4 per child. The purpose of the Haunted Hospital is a community outreach project aimed at teaching kids about the importance of practicing safety and developing healthy habits to prevent accidents and disease and to promote health. Come out and begin your Halloween celebration by visiting this fun and spooky hospital. The event serves to help raise money for the PCC SNA chapter by providing the necessary funds and resources to continue community outreach efforts of that students participate and organize all year long. It has been found that Americans rank prevention as their most important health priority and overwhelming support increasing funding for prevention programs to reduce disease and keep people healthy. The PCC NSNA Chapter believes that nurses should be at the forefront of that movement and when student nurses are out promoting health in the community they become a part of that exciting change! Last week President Barack Obama joined former President George H. W. Bush on stage at Texas A & M University to celebrate volunteerism and civic involvement. Now the AARP is helping to reinforce this message. AARP announced that beginning this week TV audiences will see Prime Time Television programs encouraging community volunteerism. More than 100 popular TV shows representing several major networks will participate in this strong television promotion October 19th through October 25th. Well known celebrities will provide public service announcements and many television program scripts will also incorporate the idea of giving back. AARP states, "Viewers will be encouraged to find volunteer opportunities in their communities at the Entertainment Industry Foundation's iParticipate website as well as the website for Create the Good, AARP's community service program that is cross-promoting with iParticipate. AARP has more than 9 million volunteers, donors and activists, age 50 and older, involved in community service. The joint promotion is a way for the two organizations to pursue a common goal-showing Americans how easy it is to make a difference." This public emphasis on volunteerism will serve to encourage nurses (active, retired, and those in student programs) to consider volunteer activity. Strengthening volunteerism is a major goal for creating the Office of the National Nurse. A National Nurse could offer guidance for effective nurse involvement at many levels to replicate successful prevention programs and address health disparities. 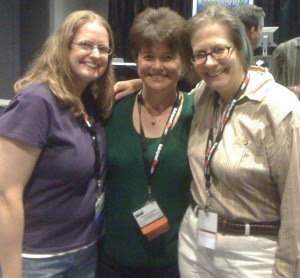 Vice President Terri Polick of the National Nursing Network Organization sent in this report from Blog World Expo 09 that took place last week in Las Vegas, Nevada. Johnson and Johnson and Medpages sponsored the medblogger track at the conference where bloggers from around the world gathered to talk about the hot topics that are currently being discussed in the medical blogosphere. The establishment of the Office of the National Nurse was one of those hot topics, and Terri reported she was able to communicate the important role blogs have played in spreading the word about the Office of the National Nurse initiative. The title of Terri's panel discussion was “Blogging for Change.” During the discussion moderator Dr. Val Jones from Get Better Health, asked each panelist to share a post from their own personal blog that they were most proud of. Terri told the audience that her favorite post, hands down, was her interview with Dr. Howard Dean. Terri went on to say that Governor Dean strongly supports the establishment of the Office of the National Nurse. Dr. Dean understands that a National Nurse is an important step in helping to keep our nation well by promoting wellness and prevention. Blogs continue to be an important tool for any grassroots organization. The campaign for an Office of the National Nurse is no exception. Thank you to the MammaCare Organization for their recent endorsement of the Office of the National Nurse initiative. One of our dedicated supporters, Cathy Coleman RN, BSN became the very first MammaCare trained nurse in the country in 1980. The MammaCare Organization recommendations remain the most published and best practice standard for manual breast examination. There is convincing evidence that American health-care reform can be dramatically advanced by deploying our greatest and most trusted national health resource, America's nurses. No other Western nation has the magnitude of skilled health-care professionals ready to serve its needs. No other Western nation needs a trusted, national public heath resource more than we do. Establishing the Office of the National Nurse would be a brilliant and practical first step in publicly acknowledging America’s nurses as the nation's most dedicated and available health-care resource. This act would give life, substance, and a trusted human face to our emergent national health-care system. If affirmed, the Office of the National Nurse will organize, enlist, and assure the deployment of nurses to serve the US health needs that have languished for generations. Our work at MammaCare provides a compelling example of the commitment by corps of nurses with little regard for gain or profit. As you know, the National Cancer Institute supported the development of MammaCare, the quality-standard program for medical practitioners to learn proficient, evidence based breast examination. Nurses represent, by far, the greatest number of participants in this rigorous, life saving program with little or no compensation. As a result each day literally thousands of US women receive proficient clinical breast examinations (CBE's) performed by trained hands belonging to RN's. The reason I feel compelled to write this letter is our constant observation of the high standards nurses hold for clinical performance and patient care irrespective of personal gain. It would be fortunate to now recognize and enlist this superior and benevolent public health resource in a central role of American health-care reform.